In any office space, glass partitions can play a key role in the aesthetic and functionality. Not only do they offer privacy and help to create individual offices, but they can also help to protect fire from spreading. They’re a solution relied on by hundreds of businesses, and they are cost-effective too. Cube 7 Interiors supply and install glazed partitions in Manchester, Liverpool and across many North West areas. We specialise in office refurbishments, office partitioning and office fit out and re-fits, but we can also discuss home renovations with you too if required. Along with offering frameless fully glazed partitioning systems, we can also equip your space with solid partitioning too. Supplied and installed office partitioning specialists, installing Komfort / SAS / Neslo Partitioning systems with award winning projects. Why not give you office a wow factor with frameless glass doors and switchable privacy glass? Many clients think they require structural glass assemblies however all of our systems are fully re-locatable and fixes underneath suspended ceilings, bulkhead or to concrete slab with deflection options up to +/-25mm if required. They are structurally tested for atrium screens and voids to BS5234 in medium, heavy and server duty. We also have every fire screen requirement for your needs? 30min, 60min, 120min, integrity and insulation. CUBE BLUE SG – Single glazed frameless partitioning is a great way to allow light in to a work environment, yet effectively provides protected workplace zones wherever concentration and creative thinking might flourish. Available in either straight lines, facets, or the foremost sleek curves, Cube7’s maximum glass and minimal framework, give the office a taste luxury and professionalism. Acoustic tests to Rw 40dB, minimal head and base sections, discreet glass to glass joint options, from non-fire rated to 60/60 fire rated. 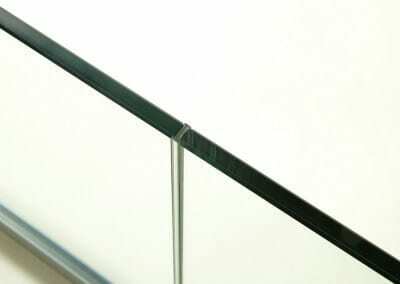 Our most modern system to give a frameless glass wall effect with standard head and base track of only 24mm. CUBE BLUE DG – Double glazed frameless partitioning to give the illusion of vast areas of unsupported glass. Our most acoustic system to provide areas of sensitive information, quiet areas and privacy. Ideal for meetings rooms, office fronts and breakout areas, CUBE BLUE is easily installed and can incorporate integral blinds controlled on manual turn nobs or automatic switch/remotes blinds. Acoustic tests Rw 41dB – 54dB, minimal head and base sections, discreet glass to glass joint options, from non-fire rated to 60/60 fire rated. Our most modern system to give a frameless glass wall effect with standard head and base track of only 24mm. CUBE GREEN; Framed Solid and Glazed Partitioning – Our solid partitioning connects seamlessly with our glazed. Available in single skin or double skin with aluminium framed or skim finish. CUBE GREEN offers the cost effective solution to break up space and create individual offices. It incorporates the benefits of tremendous acoustic performance and fire protection. GREEN is a steel stud and plasterboard construction with either a plaster skim or aluminium joint framework. This framework together with the finishing trims are power coated to any BS or RAL colour to complement your office colours and design. 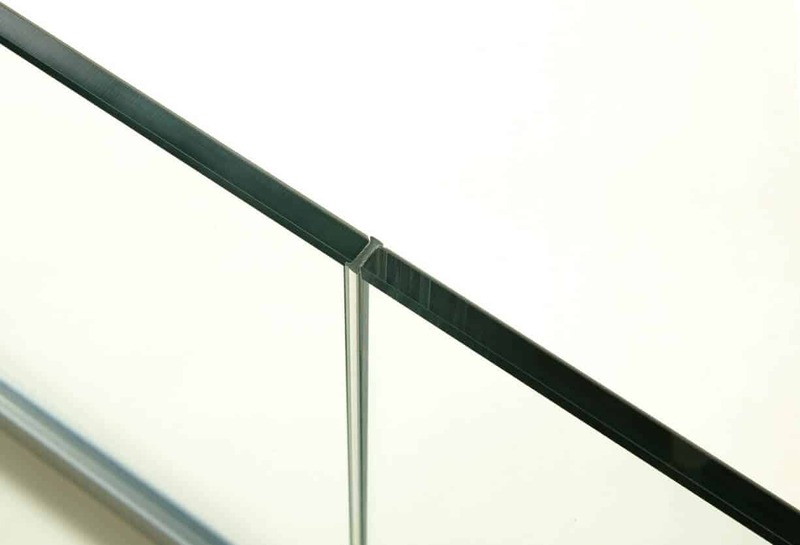 We include skirting if required, matching the powder coating of other areas. The current test ratings for fire and sound are 60 minute and 55dB (Rw). Door Integration – All of our systems are fully integrated with aluminium doorframes to be able to accept: frameless glass doors, framed glass doors, sliding glass doors, flush double glazed doors and wood timber or laminated flush doors. Glass doors acoustics up to 40dB, Glass fire doors to 60min fire rated. CUBE RED; Fire Screens – Fire rating to glass comes in two forms; Integrity and Insulation. Integrity meaning the glass structure will stay in place for the desires period of time, Insulation meaning that after that period of time the glass will still be cold and heat would have not transferred through the screen. Shown as integrity/insulation it is usually shown at either 30/0, 30/30, 60/0 or 60/60. 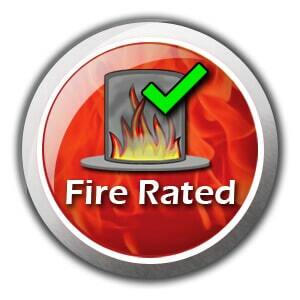 Your building regulator or fire officer will have the deciding factor on the fire rating of the screen. We off any fire rated screens to meet your requirements, either in single glazed or double glazed and framed or frameless glazing. Each specification is priced separately and we will talk to you if the glazed screen would be cheaper in a different system. Sliding Folding Walls – Cube7 produce high performance moveable folding wall panels that look as good open as they do closed. The sound proofed panels are rolled along a silky smooth ceiling suspended roller track and unique double magnetic joints click to form a seamless flush wall. Available in solid melamine, wood veneers or glass. These sliding folding wall dividers can be fire rated, acoustic, top hung or bottom hung and when room divided is no longer needed they discreetly fold away. Cube7 provide floor to ceiling storage and multimedia wall systems in a range or beautiful finishes to match your office décor. Its sleek exterior blends into the background disguising an unbelievable wealth of storage components, including options to cleverly house multimedia equipment for presentations and conferences. The systems are simple to install re-locatable if required. They provide the ultimate in storage capacity and create a smart clean appearance to any room by eliminating usual office clutter. Pass through hatches, bullet proof screens, bank screens and axe resistant glazing. Internal glass automatic opening doors. Including swing or sliding, PIR sensor or push button activated. Fire rated options available. 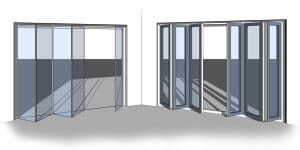 Please contact us for our Office Partitioning Brochure, for our specification pages or for more information on our partitions!